I first started dabbling with a homemade Sriracha Sauce Recipe a few years ago. I made it at Christmas time and gifted the whole batch to my husband as his homemade Christmas present that year. He was SO surprised! Since then I’ve made many variations but I’ve never gone back and revamped that original recipe. Until now that is, I’ve tweaked it, changed it a bit and now it’s printer friendly. If you have a Sriracha lover in your life considering treating them by making this Sriracha Sauce just for them. 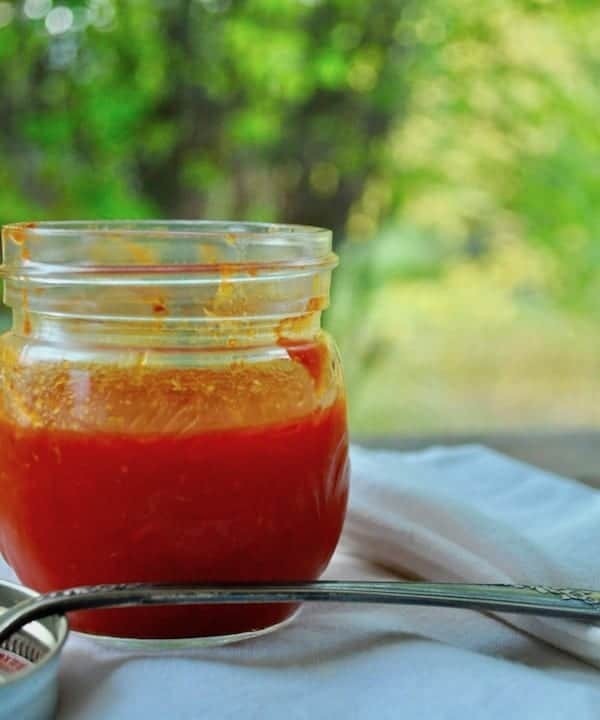 Try making Sriracha Sauce Recipe even IF you can buy it at the store! Obviously, Sriracha is easily available in just about every part of the United States but making your own takes it to another level of awesome. Because you control of the sugar, salt and heat levels you can make this perfectly suited for anyone, on any diet. On Paleo? Use honey as your sweetener. If you’re on a low salt you can lower the salt as needed. And if you just can’t take the heat you can easily make it mild as you like it. Or amp up the spice if that’s your game. 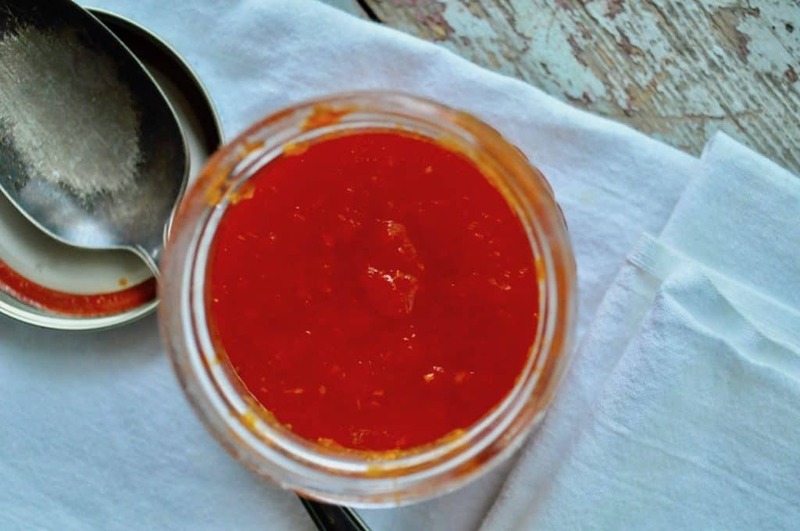 This Sriracha Sauce Recipe is Great for Food Swapping! I take this to Palmer Food Swap quite often because it’s SUCH a great swap item. People think they don’t like Sriracha but usually, after a tiny taste they realize it’s not that hot and the flavor is out of this world amazing. I am now a total convert to Sriracha and the flavor enhancements it promises. Store bought is great but homemade is so much better. Also?  it won first place at the Alaska State Fair! So I guess it’s Award-winning?!? I’ll take that! 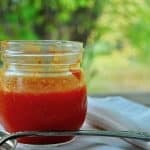 If you have a Sriracha lover in your life considering treating them to a whole fresh batch by using this Homemade Sriracha Recipe. if you LOVE heat leave those habaneros in seeds and all! What about you? Do you have a hot sauce lover in your house? Do they douse everything in hot sauce? Well then give them the gift of heat and they’ll love you forever! save the solids from the food mill or sieve. Dehydrate the solids as much as possible. Then run it through a food processor. The result is sriracha powder. Why didn’t I think of that!?! It’s brilliant! Yay for AWARD winning! Congratulations! Thank you for the recipe. This sounds awesome! I’m always afraid to handle really hot peppers like habanero (even with gloves). But, I do love Sriracha and hot sauces. Congrats for the win, too!